When you are driving on the freeway in the state I live in, as in many states, you pass by a lot of farm land and other large areas that need a lot of water. I remember how much work it was to put in our sprinkler system in our yard that is just a fraction of the size of these areas. We were able to use pipe that was 1” and smaller to get the entire system installed to water our lawn. After having the experience of putting in this system and passing all these large fields that needed a lot of water, I couldn’t help but wonder what it takes to deliver the water they need. From years around the industry, I have learned more about how this works. For larger jobs such as watering crops and other fields that span over acres of land, there is a type of pipe used that is called PIP pipe. PIP is made from PVC and comes in much larger sizes than the average schedule 40 PVC pipe that is used for watering smaller areas such as your front and back yard. PIP pipe is a little thinner than schedule 40, meaning that it can’t handle as much pressure as schedule 40. This makes sense since the pipe is much bigger the water flowing through the pipe won’t be creating as much pressure as it goes through the pipe. The water has more room to move around so the pressure isn’t as intense as it could be. PIP pipe is also used for other things beside agriculture. One of the most common examples would be a golf course. If you have ever golfed or even driven by a golf course, you can imagine that it would require a lot of water to keep the larger amounts of grass that many courses still have. It is also important to have a good drainage system so there isn’t standing water on the course. PIP pipe is used for draining water in some applications, which also makes sense because drain pipe is usually designed for lower pressure applications. PIP fittings are designed for different purposes. Like schedule 40 fittings, they have the basic elbows, couplers, tees, caps, etc. But unlike schedule 40, there are specialty fittings such as tees that are designed for riser fittings. 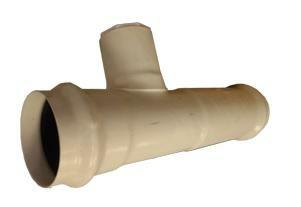 PIP pipe also utilizes gaskets for some of the fittings such as repair couplers and some tee fittings. In order to get these fittings installed, the use of lubricant is required, also referred to as “duck butter”. For other applications, PVC glue can be used to connect the fittings and lengths of pipe together. Most of the fittings have specific pressure that they can handle. If the pressure of the fitting is higher than the rating on the pipe itself, it can still be used, but the opposite isn’t true. Usually there is a sticker on the fitting that tells you what the pressure rating is, if not there may be something on the fitting that will tell you the rating.